Airbus is adopting the use of Stratasys ULTEM 9085 3D printing material as standard in the production of flight parts for A350 XWB aircraft carriers. ULTEM 9085 resin is certifed to Airbus standards material specification due to its combination of a high strength-to-weight ratio with flame, smoke and toxicity (FST) compliance for aircraft flight parts while Stratasys procedures ensure the traceability and consistency necessary for certification by the FAA. 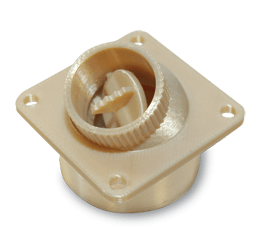 Made using Stratasys pioneered Fused Deposition Modelling (FDM) technology, ULTEM 9085 enables the production of strong, light weight parts whilst additionally substantially lowering unnecessary expenditure and delays usually experienced in the production tooling process. This technique works by extruding semi-molten thermoplastic into layers as fine as five-thousandths of an inch allowing for the creation of strong yet complex parts. FDM has been used in aerospace for the production of noncritical interior components such as light-load cabin parts which includes wall panels, cabinet doors, latches and many more. Airbus currently has more than 1,000 plastic parts on the A350 made using this advanced technology. “Amongst the various 3D printing technologies, FDM is noted for the high quality of parts produced allowing for complex part geometries to be designed and produced which would otherwise be impossible to make with conventional manufacturing methods. You can build the part you really want, not be compromised by limitations of traditional manufacturing processes,” Sevcik explains. Proven to be especially economical in reducing fuel consumption due to part lightness, FDM-based components are ideal for fuel-saving on short runs typical within the aircraft industry making them an efficient solution for reducing weight within the interior of the plane. Due to this, the aerospace industry was one of the earliest adopters of FDM, and as a result this made aerospace firms and the FAA very familiar with both Stratasys and their technology. “FDM is uniquely suited to aerospace applications due to its high reliability and repeatability, as well as ability to create thermoplastic parts with dimensional accuracy and stability,” Sevcik continues. Parts can be made lighter with unique, semi-hollow part building properties such as honeycomb structures in the centre of otherwise hollow unmanned aircraft systems (UAS) wings, adding durability with its structure and yet reducing weight. Additionally working alongside Boeing on an Infinite Build 3D demonstrator, Stratasys plans to print on a vertical plane to allow for unlimited part size in the build direction. The airframer is using this system to explore production of low-volume light parts.